The ASX200 is up a little more than 1% again this week, and believe it or not, its within 3% of its highs seen back in September last year. At the headline level optimism prevails, but under the surface, the foundations for this rally are becoming progressively weaker. A multitude of large companies spoke this week of the subdued or worsening consumer environment domestically, notably Woolworths (WOW), Coles (COL), Flight Centre (FLT) and Crown Resorts (CWN). All of these stocks saw net analyst downgrades to forecast earnings numbers, as did BHP (BHP) which still managed to reach a 5-year share price high, and Wesfarmers (WES) whose stock bounced strongly on announcing its intention to return $1bn of capital to shareholders. Beyond the consumer sector, QUBE (QUB) posted excellent first half profits, but failed to upgrade full-year guidance because of the subdued trade outlook (container volumes notably, and motor-vehicle imports specifically). Bingo (BIN) was smashed after cutting earnings forecasts for 2019 on account of the impact of slower construction on their demolitions and collections business. Net earnings forecasts are falling. More well known and regarded commentators are now openly discussing the prospect of an Australian recession and the likely need for Australian interest rate cuts, including Gerard Minack (former Morgan Stanley economist/strategist), Brett Gillespie (Ellerston), Bill Evans (Westpac’s senior economist, Bill is now calling for 2 x 0.25% rate cuts in Q4 2019) and Shane Oliver (AMP). Personally, I think it is inevitable to think we expect interest rate cuts, and if the RBA are serious about hedging against the emerging deterioration, they should move in larger size (in other words, by 0.50%) and in faster time than most expect. Forget the strong employment figures reported this week, employment trends are worsening, with ANZ Job Advertisement figures falling -3.7% year-on-year and the Federal Government’s own Department of Employment and Workplace Relations leading indicator of employment reaching a 7-year low this month. We should expect to see the Australian unemployment rate weaken back to the 5.5% to 6% range by the end of 2019 from its current level of 5%. The deteriorating employment backdrop will prove negative for wages and negative for economic activity, and have ramifications across the board for equity markets, but particularly Australian bank and consumer shares. The slowing economic backdrop should be a cause for concern. Household indebtedness is a huge factor and falling household wealth on account of house price falls will continue to bite deeper into consumer spending. Australian savings ratio’s have already fallen to 10-year lows, and require economic growth to replenish, let alone sustain current economic activity. The Federal Election is surely a handicap to near term business spending, and should Labor prevail, a future negative for domestic asset values. Banks seem highly unlikely to loosen the credit purse strings anytime soon, which then begs the question – what saves the day for us, and helps Australia avoid its first technical recession in 30 years? Sadly, I can’t see the panacea. However, the positive news is that Australian share prices are within 3% of a 10-year high. Australian banking shares are +10% off their lows, ANZ (ANZ) is even +20% from its low. On top of that, Australian shares relative to their offshore peer group have largely matched performance in the past 12 months. So despite the increasingly cloudy domestic economic backdrop, large swathes of Australian’s retirement portfolios are actually performing reasonably well and yet to see the impact from our rolling slowdown. But they will, and this is precisely why, right now, is an acutely good time to be making changes to your portfolio if indeed you are concerned about the dual-risks of a slowing Australian economy and a future Labor Government on your retirement portfolio. This is as good an opportunity as any, to diversify away from Australian franked income, be that to domestic, unfranked income sources, or in the growth component of your portfolio, to international equity exposures (we favour Asia and both long/short or value strategies offered by the likes of Platinum, VGI Partners, Orbis and Antipodes). Even more than this, this is a terrific time to raise cash levels again. We were thrilled with the +20% jump in the IOOF (IFL) share price. Results were OK, with some margin pressure in the fund administration business, but the driver of the share price was IFL’s remark that they had yet to see reason for a significant revision higher in remediation charges. We think IFL can reach $7 ahead of the late June vote by custodians of ANZ’s Onepath business as to the sale of that business to IFL. Famous last words, but we think IFL is through the worst. Another rebound from a poor performer is the +30% rise in BWX (BWX) Just like IFL, BWX had been way oversold, so some of this bounce corrects that. It would seem the core brands are tracking in line with growth expectations, inventory has normalized and the ridiculous operational performance under previous management has largely been excised. BWX at $2.10 trades on no more than 10x the annualized low end of their current guidance, which makes me think that continued delivery to plan sees this stock back above $3.00 by the end of 2019. Woolworths (WOW), Wesfarmers (WES) and Coles (COL) all saw net downgrades, but WES shares are up +5% on the week, whilst COL is -10% and WOW is -5%. WES promised a $1bn capital return, and Bunnings posted a still impressive +4% like-for-like sales growth, but in the end WES will certainly see earnings risks emerge in 2019 as housing’s downturn bites on the DIY market. WES are however in the enviable position of having as much as $10bn in balance sheet firepower with which to make acquisitions, at a time when the value and prospects of many businesses are set to weaken. Both COL and WOW face pressures in their core supermarkets business from potential trading down (see Costa Group’s weak sales figures on high-end fruits such as avocado and berries) and from wage costs, whilst their discount department businesses are right in the line of fire from an embattled consumer. Both stocks ought go to lower and are far from cheap. BHP (BHP) went up despite the weaker profit figure and the falling iron ore price this week. The stock reached a 7-year high here this week, and now looks much more fairly valued against a long-term iron ore price of US$65/t to US$70/t. It’s hard to expect much more from BHP or RIO near term I feel. QUBE (QUB) – good figures but no upgrade to guidance because the group flagged a softening in container volume expectations (in other words a slowing economy). We have loved QUB and still think it’s a wonderful business, but at $2.85+ it does feel very fully valued in the current economy. Afterpay (APT), SEEK (SEK) and Costa Group (CGC) all report next week. On Friday it is the deadline for a China/U.S. trade deal, though most now expect that timeline to pass by way of extension. I would see that as a negative. The following week please note that we get Australia’s Q4 GDP figure. Ordinarily I wouldn’t pay much attention to such a backward-looking figure, however I expect it to be a negative headline, and to catalyze calls for a domestic rate cut and a likely significant fall in the Australian Dollar. In a sign of the times in which we live, markets globally have swung from extreme greed in late September 2018, to extreme fear in December, and now back to knocking on the door of extreme greed again as recently as this week (CNN Fear & Greed index). The ASX200 is up +8% year-to-date, and a surge of optimism overtook investors in recent days as the RBA Governor tempered his economic outlook, conceding the domestic interest rate policy to be ‘more evenly balanced’ than before. Investors cheered the dovish remarks never mind the fact they were in large part motivated by a significant deceleration in domestic data over our summer – NAB Business Conditions and Australian Service sector activity collapsed to their lowest levels in 4-years. Further grounds for investor optimism stemmed from the Banking Royal Commission where investors cheered the absence of major structural reforms or incremental penalties. As a result, Australian shares led their global peers this week, rising +4%. Weird huh, but don’t believe the hype. This is the time to make some sales. Make no mistake, Australian interest rates will be cut in 2019 – in fact, I think there are grounds to go pre-Federal Election – but the cut to rates will be a rear-guard action designed to protect business confidence in the wake of construction weakness and political uncertainty associated with a likely Federal Labor Government. On Friday the RBA themselves cut their FY2019 GDP forecast significantly from 3.25% to 2.5% (remember we are already 7mths into the year). The rate cut will be welcome news, but it is the finger in the dyke, not the accelerant to the fire. This surge in investor buying will all be in vain, as Australia’s domestic economic outlook is now firmly in rapid retreat and likely to lead to ongoing corporate profit downgrades as 2019 progresses. Where we advocated for buying the dip in late October and again in December, we are now firmly of the mindset to be TAKING PROFITS in certain Australian equity positions after this phenomenal bounce back. In fact, local investor optimism seems to be coming precisely before the housing slowdown truly impacts employment and certainly comes with little concern for the negative impact on local asset prices (in the near term at least) associated with a likely Labor Government. It’s a little perplexing to be sure but remember too that we did start the year on a very negative footing, so this rebound might indeed be a similarly aggressive snap-back to counterbalance last year’s pessimism. Either way, I fully expect the enthusiasm to peter out, and for those of you looking to build cash war-chests, now is the perfect time. The tragic dam collapse in Brazil that has forced Brazilian iron ore major Vale (VALE5) to suspend shipments, helped Australian mining shares to reach record highs this week. Rio Tinto (RIO) shares surged to a 10-year high above $90, and BHP (BHP) too rose to a 4-year high. In response to Brazilian shipment issues, iron ore futures have spiked to over $90/ton from the low $70’s only a fortnight ago and a range of $65-70/ton during much of Q4 2018. RIO is now +30% since early December, BHP is +20% and Fortescue (FMG) is +50%. In both BHP and RIO’s instance, the stocks are now trading at or near long-term asset valuations and at around 14x a normalized profit which assumes iron ore prices returning to a long-term average of around $65/ton). Since this recent commodity price spike is likely to be short-term in nature, and since we feel very convinced in the likely decline in Chinese steel production in 2019 and 2020 and the subsequent iron ore surplus that is set to emerge, it seems an ideal opportunity for those investors fortunate enough to have ridden these miners up, to book some profits. The opportunity to TAKE PROFIT here is a good one. We rarely speak of the economic situation in Europe in this column in large part because its rarely worth mentioning, however it was notable on Thursday night to see the European Commission slash their 2019 forecast for economic growth from 1.9% to 1.3%. Notably, the EC dropped their assumption on Italian economic growth from 1.2% to 0.2% and on the UK from 1.7% to 1.2%. These cuts are significant in size, but also of note given the enormity of Europe’s sovereign debt. Without growth, debt won’t be repaid, and the prospect of an escalation in intra-European haggling over financing seems assured. Overnight the French Ambassador to Italy was recalled, taking relations between Europe’s 2nd and 3rd biggest economies to their lowest ebb since WW2. Whilst much of our focus has been on the trade war in recent months, the structural issues facing Europe remain enormous and it wouldn’t be a surprise to see a negative curve-ball emerge out of Europe in 2019. DOW results were a little light against forecasts as a couple of problem contracts hampered the group’s excellent exposure to Australia’s east coast infrastructure boom. The Spotless acquisition missed earnings figures moderately, but cash conversion continues to improve, which is good news. DOW has outperformed the market significantly in recent months, so perhaps it was due a pause, however we feel like the momentum remains strong for the group and on 14x earnings, it is far from expensive given end-markets remain so good for their key transport, rail and engineering assets. 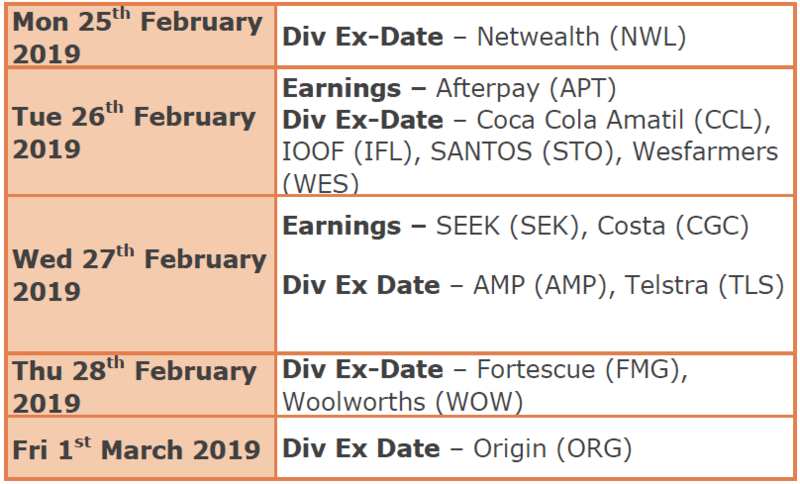 Result dates for corporate earnings are filed in the table below, but we are particularly interested in results from AMCOR (AMC), Telstra (TLS) and Challenger (CGF). It will be good to get an update from AMC on merger plans, but also to see if the fall in key polyethylene input prices had done a good job at counteracting continued volume softness in the group’s North American rigid plastics business. On TLS, we think numbers will be sound and the market will continue to warm to an improving backdrop for the company. I repeat the idea that TLS will outperform in 2019 and likely trade towards $3.50 on the optimism surrounding a more benign environment for mobile competition, and the likelihood of an NBN write-down by Labor soon after their May Federal Election win (this should spur great profitability for NBN resellers like VOC, TPG and TLS). On CGF, though we have already seen the downgrade, we are interested to get more details on the composition of the miss, and to ascertain industry volumes currently and expectantly ahead of favourable new legislation due on July 1st this year. It’s safe to say that many trustees whose funds are in full pension mode are very concerned about the possibility of losing their franking credit refunds should labor win the next election. There is a lot of noise in the media indicating that SMSF’s are going to be the hardest hit and trustees are considering whether an APRA Fund (retail/industry fund) would be a better option moving forward should labor be victorious at the polls. Is “shutting up the SMSF shop” really the answer? The real question is why would a trustee find an APRA fund a better solution than an SMSF and what options are available to even up the playing field. If Labor’s proposal is passed, APRA funds face the same issue as an SMSF. However the main difference is APRA funds have members who are both in accumulation mode and pension mode. Those in accumulation mode are likely to also be making taxable contributions into the fund which means they are paying 15% tax on both the income that their member balance generates and on their contributions absorbing the franking credits received. This mix of accumulation and pension members is absolute key in helping to solve the inequity between SMSFs and APRA funds. Following are four strategies which may be considered for those funds who are in full pension mode. Where members don’t need the pension income, consider rolling back to accumulation mode. The maximum tax payable on income and capital gains is 15% which still makes accumulation funds a tax effective vehicle. Before rolling back to accumulation it’s prudent to review the unrealised capital gains position of the fund and consider realising any gains prior to rolling back to take full advantage of being in a tax exempt environment. Members that roll back to accumulation are still able to take money out of the fund via a Lump Sum Withdrawal if cash is required. You can ensure the maximum amount possible is retained in a low tax environment (compared with tax rates outside of super). You may wish to consider rolling back part of the pension to accumulation. You can preserve the capital for longer but leave room in the Transfer Balance Cap if a member finds themselves in receipt of a reversionary pension. Consider making taxable contributions into the fund (assuming eligibility criteria is met) if there is sufficient income outside of super to generate a tax deduction in the member’s name. The fund will then benefit from the franking credits in the SMSF offsetting any tax payable in the fund. Consider adding members who are in accumulation mode such as adult children. If legislation passes to allow for a six-member SMSF then grandchildren who are contributing to super could also be considered to make use of the franking credits. With this strategy the SMSF is benefiting like an APRA fund through having a mix of members. Before making the decision to implement any of these strategies consult your financial adviser as implementation may have a negative impact on Centrelink entitlements and potentially create Transfer Balance Cap issues in relation to reversionary nominations previously made. If you are still not sold on any of the above strategies, then have a chat to your investment adviser about alternate investment options which don’t involve receiving income with franking credits attached. The decision to wind up an SMSF and transfer to an APRA fund should not be taken lightly. Not only can this have a disastrous impact from a centrelink point of view if your pension is grandfathered but it is important to remember why you set up an SMSF in the first place. Control, flexibility, investment choice, better performance and transparency are normally on most people’s list. At the end of the day the government will always try and interfere with superannuation but SMSF’s still remain the most tax effective wealth creation vehicle. For more information, please talk to your financial adviser. Disclaimer: The information in this article contains general advice and is provided by Primestock Securities Ltd ABN 67 089 676 068 AFSL number 239180. That advice has been prepared without taking your personal objectives, financial situation or needs into account. Before acting on this general advice, you should consider the appropriateness of it having regard to your personal objectives, financial situation and needs. You should obtain and read the Product Disclosure Statement (PDS) before making any decision to acquire any financial product referred to in this article. Please refer to our FSG (available at https://www.primefinancial.com.au/fsg-2/#.WNhTAHR95sM) for contact information and information about remuneration and associations with product issuers. The Government’s 2016-17 Budget included proposed changes to how retirement income products, including lifetime annuities, are to be means tested from 1 July 2019. The proposed changes are linked to the introduction of Comprehensive Income Products for Retirement and are intended to encourage people to use their retirement savings in a way that supports their needs and helps manage the risk of running out of money as they get older. This article outlines the proposed changes and discusses possible benefits from using lifetime annuities as part of your retirement income strategy in combination with the Age Pension. The income and assets tests assess what personal resources retirees have available to support themselves, and then calculate how much Age Pension is offered according to the lower result from the two tests. For example, a homeowner couple can hold up to a combined $848,000 (homeowner singles $564,000) of assessable assets and/or generate up to $79,736pa (singles $52,120pa) of income and still receive a Part Age Pension. Some assets and income receive favourable means test treatment. Your Principal Home and Pre-paid Funerals are fully exempt; some retirement income streams might be fully or partially exempt depending on when they were purchased. For lifetime income streams (e.g. a lifetime annuity) purchased from 20 September 2007 – 30 June 2019, the means tests take into account both the annual income payment and the capital purchase price. Both are reduced by an annual ‘Deductible Amount’. Only the amount of income above the annual deductible amount is counted for the income test, and the assessed capital declines each year by the cumulative annual deductible amount. Under the current rules, a lifetime annuity can immediately reduce the amount counted under the income test but reduces the capital counted under the assets test slowly over time. Assess 60% of the lifetime income stream capital as an asset until the recipient’s age 84 (or for a minimum of 5 years) reducing to 30% counted thereafter. Slightly different treatment will apply to a lifetime income stream that offers a death benefit or surrender value. Annuities purchased prior to 1 July 2019 will retain the current means test treatment. The proposed treatment may be beneficial where a Part Age Pension would be determined under the assets test, as up to 40% of the annuity purchase price would be immediately exempt. Part Age Pensioners in this category could immediately achieve an increased Age Pension payment if they use part of their retirement savings to purchase a lifetime income stream after 1 July 2019. However, if the income test assessment prevails in later years once the retiree’s capital has declined, future Age Pension entitlements might be lower. Although there is likely to be a trade-off between higher income in earlier years and lower income in later years (a bird in the hand so to speak), industry analysis suggests the overall outcomes are broadly similar under the current and proposed tests. The proposed rules generally result in more of the annuity income being assessed under the income test compared to the current ‘deductible amount’ method, probably resulting in lower Age Pension payment than under the current treatment. However, an opportunity currently exists for retirees with a Part Age Pension determined under the Income Test if they purchase a lifetime annuity before the new rules are implemented. The expected start date for the new treatment is 1 July 2019; however, the Social Services and Other Legislation Amendment (Supporting Retirement Incomes) Bill 2018 is still before Parliament and has not yet attained Royal Assent. Talk to your adviser well in advance of 1 July 2019 about whether a lifetime annuity might help you increase or attain Age Pension entitlement. “The information in this article contains general advice and is provided by Primestock Securities Ltd AFSL No. 239180. That advice has been prepared without taking your personal objectives, financial situation or needs into account. Before acting on this general advice, you should consider the appropriateness of it having regard to your personal objectives, financial situation and needs. You should obtain and read the relevant Product Disclosure Statement (PDS) of any financial product discussed in this article before making any decision to acquire it. Please refer to our FSG (available at https://www.primefinancial.com.au/wp-content/uploads/2018/08/PS-Financial-Services-Guide-V16-15-August-2018.pdf) for contact information and information about remuneration and associations with product issuers. Also, while the article need not contain the link to the statement that industry analysis shows that the outcomes under the current and proposed assets tests are broadly similar, we suggest you retain the supporting material on file. This helps protect you against a suggestion that the article is misleading, deceptive or contains unsubstantiated statements.